Incorporate luxury to your sanctuary with the charming Celtic Circles scalloped bedspread by Superior. Its detailed flair is whimsical and sure to turn your bedroom into a total retreat. This bedspread is woven from 100-percent cotton on a jacquard loom. Featuring a textured matelassé Celtic pattern that gives the blanket a feeling of weight, structure and bound corners to prevent fraying. Available in an assortment of ten beautiful colors, this detailed, circle pattern with a scalloped edge brings an elegant touch to your favorite space. This bedspread is of excellent quality. It fits a king size bed very nicely.the design is subtle but attractive and looks great with either traditional or contemporary furniture. 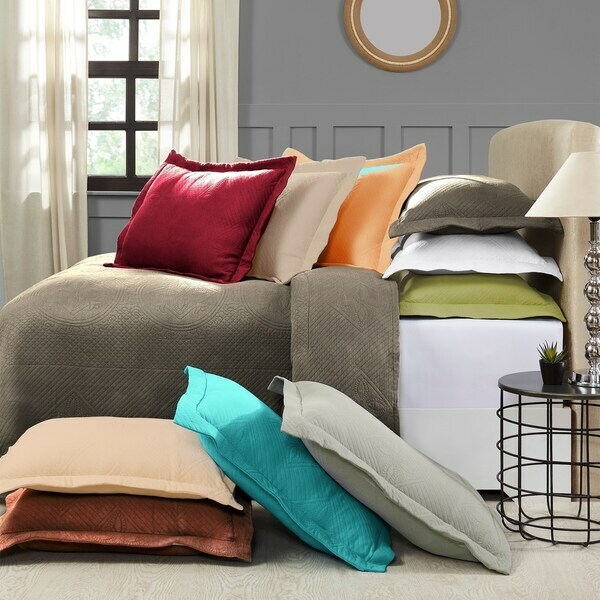 nice lightweight bedspread that works great as a quilt on deep mattress sets. still does not go to the floor on a king but the box spring is covered.